0.00% introductory APR for 15 months. After that, your APR will be 18.74% to 27.74%, based on your creditworthiness. This APR will vary with the market based on the U.S. Prime Rate. After that, your APR will be 18.74% to 27.74%, based on your creditworthiness. This APR will vary with the market based on the U.S. Prime Rate. A balance transfer request must be made within 120 days from account opening to qualify for the introductory APR. 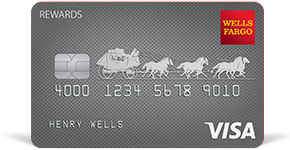 Read the Wells Fargo Rewards Visa Card Agreement. See the Visa Guide to Benefits (PDF) to learn more. Overdraft Protection by linking your credit card to your checking account, finance charges apply. See the full Terms and Conditions. Card and Account Activity Alerts to track purchases and account activity. This card automatically comes with Go Far Rewards and there is no need to sign up. The "Margin" for purchases and balance transfers will be 13.24 to 22.24 percentage points, based on your creditworthiness. Cardholders will earn one (1) point for every $1 spent in net purchases (purchases minus returns/credits) made on the Credit Card account, rounded to the nearest whole dollar. During the first 6 months from the date the account is opened, for purchases made at retailers whose merchant code for Visa is classified in one of the following categories: grocery stores, drugstores and gas stations, Cardholders will earn four (4) points for every $1 spent in net purchases made on the Credit Card account, rounded to the nearest whole dollar. The maximum amount of bonus points you can earn under this promotion is 50,000 (which is $12,500 in net purchases) regardless of how much you purchase or how many transactions you make during the promotional period. Purchases not processed using these merchant codes for Visa will not qualify for bonus points. Wells Fargo does not have the ability to control how a retailer chooses to classify their business and therefore reserves the right to determine which purchases qualify for bonus points. You may not earn bonus points for purchases made through third-party payment accounts, at online marketplaces, with retailers who submit purchases using a mobile/wireless card reader, or if you use a mobile or digital wallet. These additional points earned during the first 6 months at the select merchants will appear on the Cardholder's account statement 1-2 billing periods from the date earned. ATM transactions, cash advances of any kind, balance transfers, SUPERCHECKS™, cash equivalents such as money orders and prepaid gift cards, casino gaming chips, wire transfers, off-track wagers, lottery tickets, or bets or wagers transmitted over the internet, fees or interest posted to a linked account, including but not limited to returned payment fees, late fees, and monthly or annual fees, do not earn points. Refer to the Summary of the Go Far® Rewards Program Terms and Conditions and Addendum to the Go Far® Rewards Program Terms and Conditions for details. Participating merchants of the Earn More Mall® feature control the variability of the offers shown. Bonus rewards are earned on net purchases (purchases minus returns/credits) only. Review full Earn More Mall feature Terms and Conditions for all earning details. Flights must be redeemed through Go Far® Rewards. Refer to the Summary of the Go Far® Rewards Program Terms and Conditions and Addendum for the Wells Fargo Rewards® Card for details. Cash redemption options by phone or online are available in increments of $25 only.